Let me start by saying I love the New England Patriots. I love Quarterback Tom Brady. He is clearly the best QB the team (and quite possibly the NFL) has ever had. However, listening to the sycophants in the Monday Night Football booth drool over his every move is embarrassing. 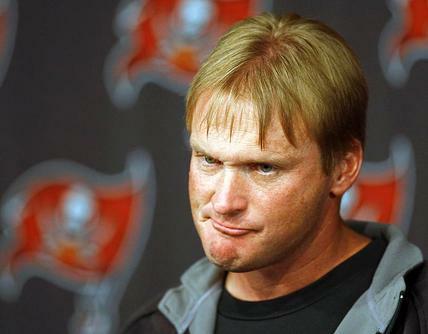 Specifically, Jon Gruden needs to start thinking and speaking like a coach and not someone who wants to replace Brady’s supermodel wife. In fairness it was a record setting night for the Pats. It is also fair to say that an analyst should not not sound like a public relations agent for a player when doing his job. Homerism seems to be on he rise in sports broadcasting, at least in what I hear. However, on a national broadcast, even when it involves my team, this stuff is way over the line. Call the game and focus on the nuances of what is happening. Sounding like you are Bachelor #1 on the Dating Game has got to stop. Posted on September 14, 2011, in Television, Uncategorized and tagged broadcasting, football, mnf, nfl, sports, television, tv. Bookmark the permalink. Leave a comment.